"You'll be taken more seriously if you _____." "Don't wear ________ if you want to land that client." "You have a suit, right?" "Have you thought of straightening your hair?" The last one still gets me - another human grown-up suggested that I should alter my looks. Funny thing, I was immersed in an amazing career at the time. Fast forward a few years, a move, a new business, a new chapter and those words still linger. This isn't a post about how different women (especially business owners) are treated in business (that's a post for another time). This is about having fun. We work our keister off doing what we love. Hours of practice, days at your desk, struggling and succeeding at mastering whatever it is. Jeez-golly! Why not weave in a bit of fun? I recently walked into a meeting, greeted everyone in the room and out came Wonder Woman. 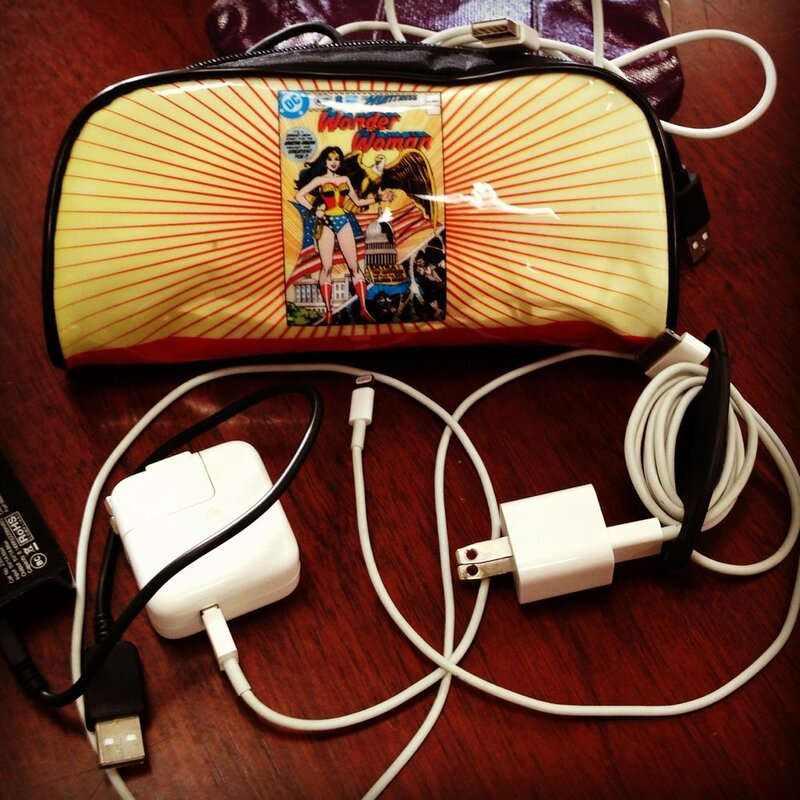 It's a pencil case that I carry around all my cables, and widgets, and technical nuggets we can't live without. Mild-Mannered Guy in Grey Suit stared. Clearly the appearance of a pencil case turned gadget gatherer was too much for his world. Unzip, grab cord, zip, plug in, done. I set the bag back down. "Life's too short - let's have fun." I say, making eye contact with MMGGS. The meetings proceeds - items are discussed, decisions are made. You know the drill. Because. Wonder Woman. That's why. Next question, please. Because, I was once offered one of those Targus brand laptop briefcase bags with a compartment for things I didn't even own. "Use this. You'll be taken seriously." And did my IBM Think Pad (I know, you're jealous) really need the protection of ballistic nylon? I think I used a backpack. it had a special sleeve and it was way easy to traverse the country with. Somewhere in the hum of proposals, and production, and time with clients, we can get bogged down in the tasks and caught up in the expectation that "I am a ____. I should ______." Do other people want you to make or do stuff with or for them...with real cash money involved? Can you sit down in front of your work and express love in your craft? Can you lie in bed at the end of the day and feel pretty darn good about things? Do the bills get paid? If you can say yes, then you've got it made. We can work hard, be passionate, solve problems, be successful, AND enjoy it along the way. Sure there may be limitations to letting your freak flag fly as far as you'd like. Make note and move on. You still get to show up and make magic in that way you do best. But don't let them tell you that there isn't room for a bit of fun. If you need me, I'll be the one with Wonder Woman.